(28392), Seal, Board of Education of the City of Detroit, Detroit, Michigan, 1929. 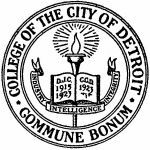 (28393), College seal, College of the City of Detroit, Detroit, Michigan, 1925. 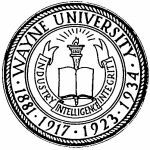 (28394), University seal, Wayne University, Detroit, Michigan, 1935. (28395), seal, Wayne University, Detroit, Michigan, ca. 1940. (28397), seal, Wayne State University, Detroit, Michigan, 1956. (28398), centennial logo, Wayne State University, Detroit, Michigan, 1968. (28399), Centennial logo, Wayne State University, Detroit, Michigan, 1968. 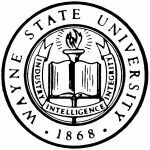 (28400), University logo illustration, Wayne State University, Detroit, Michigan, 1982. (28401) University logo and wordmark, Wayne State University, Detroit, Michigan, 1982. (28402), Tartars logo, Wayne State University, Detroit, Michigan, 1992. (28403), University logo, Wayne State University, Detroit, Michigan, 2012.